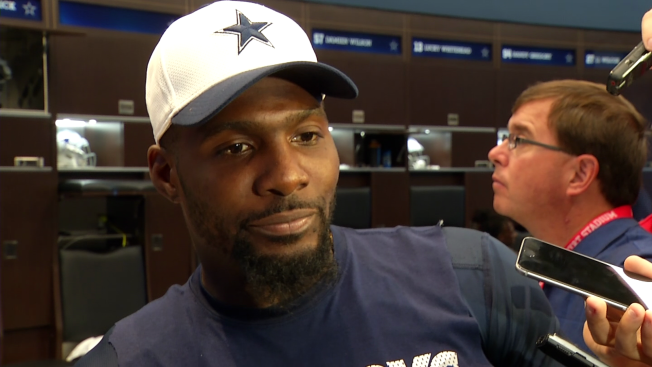 Bryant Regrets Early Week Disappearance: "I Could Have Done a Way Better Job On My Part"
Dez Bryant talks to NBC 5's David Watkins, Sept. 30, 2016. Dez Bryant would like a "do-over" regarding his behavior earlier in the week. The Cowboys star wide receiver missed treatment on Monday, a scheduled MRI on Tuesday and wouldn't communicate with the team. Reason being, Bryant anticipated bad news regarding a knee injury he suffered on Sunday against the Chicago Bears. "Everything is good. Things could have been done a lot different. I could have done a way better job, you know, on my part. It was more so on really not wanting to see what was going on with my injury," said Bryant. The situation put head coach Jason Garrett in the difficult position of trying to answer questions about Bryant's whereabouts and ambiguous injury. "Me and coach, we talked it out. It was a good conversation, it was good. You know, like we also do [we talked about how to] learn from things and get better. Nobody lost any sleep, everything was good and we're moving on to San Francisco," said Bryant. The diagnosis is a hairline fracture in No. 88's right knee. If anything, it's a short term-injury. "Luckily, it was way better than what I thought. Everything is good and I'm ready to get back on that field whenever that time is," said Bryant. Bryant is currently day-to-day and he's feeling better than he did earlier in the week. The hairline fracture may not prevent Bryant from playing this Sunday against San Francisco. If he plays, he'll endure a lot of pain and risks further injury. "It is day-to-day and we want to be safe. It's a long season, and like I said, I feel good and we'll just go from there," said Bryant. The wide receiver has faith in his teammates to get the job done against the 49ers without him if he can't go. He reiterated several times that he wants to be smart about this injury.